The website globalfirepower.com offers comparisons of military strenght of 136 countries of the world, based on on individual and collective factors when it comes to waging a prolonged campaign against another party. The Czech Republic ranked 30 in the last edition, behind Greece and Ukraine, and ahead of Sweden, Switzerland or Belgium, which may be both surprising and flattering for the Czech Army. Let’s compare the military equipment data used in this project. This would stand for 40 combat aircraft and 17 attack helicopters. The official overview says 35 combat aircraft (JAS-39 Gripen and L-159 ALCA), and it confirms the figure of 17 attack helicopters (Mi-24 and Mi-35, which is the export designation for Mi-24V). The difference of 5 combat aircraft might perhaps be caused by 6 jet trainers L-39 operated by the 213th Training Squadron, yet these are neither fighter nor attack aircraft. Seven of the 35 combat aircraft are trainers JAS-39D and L-159T ALCA. The army overview for 2018 says there is 119 Main Battle Tanks (all versions of the T-72), 439 Armoured Combat Vehicles (all combat versions of infantry fighting vehicles BVP-1, BVP-2, BPzV, Pandur II 8x8 CZ and armoured personnel carriers of Pandur II 8x8, OT-90 and OT-64 types), and 179 artillery systems of 100 mm caliber and above (all versions of cannons/howitzers ShKH M77 Dana, self-propelled mortars ShM 85 and 120 mm M1982 mortars). The main issue of these figures is the number of combat tanks. The 73rd Tank Battalion operates 30 T-72M4CZ’s main battle tanks produced between 2003 and 2006, an upgraded Czech variant of the 2nd generation Soviet T-72 (produced in Slovakia under a license) to become comparable with the 3rd generation MTB’s, based mainly on Gulf War (1991) experiences. The other 89 tanks from the official figure are the VT-72M4 CZ recovery tanks (there are three of them in service with the 73rd Battalion), and mainly several different variants of the original T-72 (like the T-72M and T-72M1) which are placed in long-term storage, and their combat value is low and decreasing rapidly, not to mention lack of trained and experienced crews to man these vehicles in case of need. 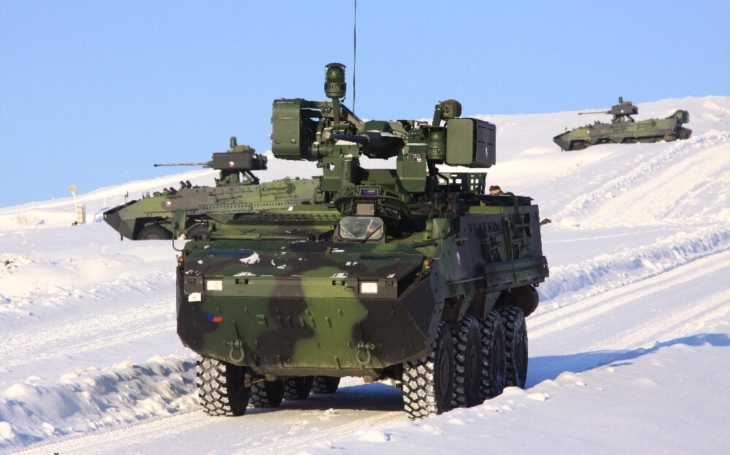 Among the vehicles which are not limited by the CFE, the Czech Army operates 149 vehicles based on infantry fighting vehicles and armoured personnel carriers of various types (observation, command, technical, minelaying, recovery variants of the OT-90 based on the BVP-1, etc. ), and some of these may explain the difference between the official figure of 439 armoured combat vehicles, and 518 armored fighting vehicles presented by the globalfirepower.com. The self-propelled artillery of the Czech Army is an interesting and current topic. The previous government approved a deal in 2017 worth CZK 1.27 billion (USD 64 million) to modernize 33 ShKH M77 DANA self-propelled howitzers and to buy 17 new systems to complete and upgrade the artillery equipment of the Czech Army. One of the main reasons for the modernization being the army stores about 60 thousand of 152 mm rounds for the ShKH M 77s. The project has been cancelled at the beggining of 2018 by the new minister Karla Šlechtová. According to her, the DANA howitzers „do not comply with NATO standards regarding their range and caliber“, and the country might want to acquire up to 50 new self-propelled howitzers made by a NATO member state, worth up to CZK 10 billion (USD 490 million). Currently both artillery battalions of the 13th Artillery Regiment are equiped with the ShKH M77s, while the 7th Mechanized Brigade deploys eight self-propelled mortars ShM 85. The L-159 Light Attack Jet to serve with the USAF?